PhillyPumptrack’s Kenn Rymdeko and Harlan Price receiving a check for $10,000 check from Parkside Association of Philadelphia Executive Director Lucinda Hudson. The long-awaited Philly Pumptrack is progressing smoothlywith a few bumps, jumps and berms, of course. At last night’s Parkside Association of Philadelphia (PAP) community meeting, Lucinda Hudson, Executive Director of PAP, presented Philly Pumptrack with a $10,000 check from Monster Energy Drinks and Brown’s ShopRite. 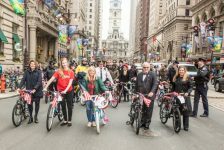 This gets us closer to putting kids and families on bikes, commented Heidi Grunwald, Project Coordinator. Jim Dellavalle and two Power Corps PHL volunteers bringing the West Parkside Community up to speed on pump track progress. As Philly Pumptrack builder and designer Jim Dellavalle displayed drawings and Power Corps PHL volunteers explained the groundwater run-off control initiatives, there were some concerns voiced from the residents of the community. Many had never heard of a pump track and were concerned of the possible disturbances and fees. They were relieved to hear that the pumptrack is a non-motorized cycling course, would be a free resource for kids and families, and that bikes and gear were being donated by Fuji and Specialized for all to enjoy. If you would like to dig in the dirt, Philly Pumptrack will be holding volunteer work days every Saturday, starting November 23. Check out their website for more details. Stay tuned, as they will be having an official ribbon-cutting when they open to the public in the Spring of 2014. A pump track is a dirt bicycle course with various bumps, jumps, and berms that allow riders to navigate the loop continuously without pedaling but by using weight shiftsor pumpingand gravity. Check out this video of the Alexandria Pump Track in NJ. Alexandria Pump Jam 2013 from VideoTrailReviews.Com on Vimeo.